ZombiU menu showing old version number, and new post-patch version number. 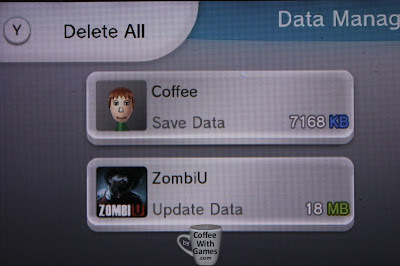 ZombiU released with the Wii U on November 18th, and it was the first Wii U retail game I purchased with our console on launch day. I really enjoyed my first play-through of ZombiU, and disagreed with some of the early "professional" critic reviews of the game, that I found lacking basic information and the reviewers failed to answer simple questions (still). While I didn't experience any game-breaking bugs or glitches in my first play-through of the campaign, I do know some Wii U owners that did (my neighbor being one of them). If you experienced any of the game-breaking glitches in ZombiU, perhaps you have been waiting and hoping for a patch to fix some issues. As the title tells you, the first ZombiU patch is now live (at least in the U.S.)! If you want to see how long the ZombiU patch took me to download and install, the patch size, as well as a few fixed issues, then grab your cup of coffee and hit the jump! ZombiU's first patch apparently does fix the nursery glitch (mentioned here & here). The nursery glitch was probably the most famous (or, infamous?!) ZombiU bug/glitch, at least one that caused players to have to start completely over. Other than fixing the nursery glitch though, there have not been any official patch notes released yet, letting us know what exactly has been fixed. 1) Nursery Glitch - Mentioned fixed with patch (Mission 12 below). 2) Supermarket Glitch - Mentioned fixed with patch. 3) Arena Glitch - Said to be fixed (Mission 14) below. 4) Falling through level/map in certain areas. - Not known if fixed. 5) Missing gas canister - Said to be fixed (Mission 13) below. ". On Mission 12, in the Nursery MAP, the interaction with the door in the basement of nursery was missing at rebirth if specific steps were followed.
. On Mission 13, in the Gas Station MAP, a Mission object that is mandatory to complete the objective was missing if specific steps were followed.
. On Mission 14, in the Circus MAP, if the player died right after recovering his Backpack, and rebooted the Wii U console, the objective was not updated.
. On Mission 15, in the Bunker MAP, the Panacea disappeared after the Player died while downloading it. However the objective remained the same (download Panacea).
. On Mission 10, in the Tower MAP, the Objective "Secure landing site" was not validated if specific steps were followed.
. On Mission 15, in the Bunker MAP, if specific steps were followed, the Player might get stuck in the Bunker after he took Doctor's eye / Panacea because a Ladder disappeared.
. On Mission 16, in the MAP Safe House, the iron curtain in the Safe House lacked of collision during Mission 16. This Bug could lead to a scoring exploit on leaderboards.
. In the Safe House MAP, the Player saw a placeholder text when he dragged & dropped an item from the Blue Box to his holsters following certain steps.
. On Mission 12 or 15, in the Nursery MAP, the game crashed if the Player burned the Zombi Nurse while she died.
. Online messages spawned in the first section of the MAPs.
. Uplay cricket bat Cast Shadow has been removed.
. Optimizations of the framerate"
Once I see what the patch addresses, either from official patch note(s) released, other gamers playing and confirming issues fixed, or from when/if I play through the game again, I'll update the list above appropriately. Only 18 MB, so not a large patch compared to other Wii U games' patch sizes. I have written a few different times about my experience(s) with ZombiU, which you can read here, here, and here. If you were concerned with some of the early "professional" critics' reviews of ZombiU, I would suggest you take a look at my "Critics vs. Customers! ZombiU reviews, or zombie reviewers?" post from December. There's a phrase that's pretty popular for when people are late to events, "Better late than never!". I think this phrase can be applied to ZombiU's first patch. With Nintendo of America just releasing the new Wii U ZombiU Deluxe Set (includes Nintendo Land via download, ZombiU and the Wii U Pro Controller), I'm glad to see that Ubisoft did get a patch out for the game resolving at least one issue in it. Hopefully the patch addresses the other bugs/glitches I mentioned above, and again, I will update that list when it is confirmed what exactly the patch fixes. Did any of you experience glitches in ZombiU, and perhaps not finish the game because of them? If so, which bugs/glitches did you experience, and now that a patch has been released for the game will you be trying to beat the game (again)? If you held off on buying ZombiU because of the reported bugs and glitches, does the fact the game has been patched make you more likely to buy it now? Unfortunately, I don't qualify for any of the above questions - except that if I actually had a Wii U, this was probably the first game I would have picked up for it, so the reported glitches I had read about wouldn't have been a deterrent. That being said, it's nice to see them addressed. Not sure if my "update" was "updated" when you had commented earlier, but apparently they fixed a few more things than just game-breaking glitches, which is nice to know. Nice write-up! Might keep my eye on this site. I have seen a few comments around, that say you need to start a new file from the beginning. If you already had a file, the patch might not override a bug/glitch already experienced. Glad you found it, and thanks for leaving the feedback!